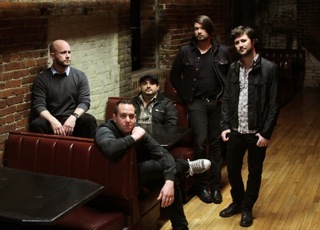 When Taking Back Sunday announced they were going to do a tour performing "Tell All Your Friends" in its entirety, it quickly became one of the most anticipated tours of fall 2012. With supporting bands like Man Overboard, Transit, The Menzingers on select dates and fellow New Yorkers, Bayside, on the whole tour. It’s no surprise a majority of dates sold out immediately. Three dates were added for lucky Philadelphia fans, which all sold out quickly. The first two at the Electric Factory, and the third and final performance was an intimate acoustic show at a smaller venue known as The First Unitarian Church. Transit and Bayside were on the bill as well. Bayside hit the stage right before Taking Back Sunday, opening up with 'Sick, Sick, Sick' off their most current release, "Killing Time". The New York four piece have played Philadelphia countless times over the years and it’s evident the crowd still can’t get enough of them. The set was seemingly flawless, with the crowd consistently echoing over charismatic front man, Anthony Raneri. The eleven song set included songs from all five studio albums, including 'Duality', 'Carry On', 'Masterpiece', ending with 'Devotion and Desire'. Soon after Bayside exited, Taking Back Sunday took the stage opening up with 'What’s It Feel Like To Be A Ghost?' off their third full-length "Louder Now". They played about eight songs, ending the first half of their set with 'MakeDamnSure', before taking a quick intermission. Michael Rapaport’s monologue from the 1996 film 'Beautiful Girls,' which appeared on a demo version of 'Great Romances of the 20th Century' opened up the "Tell All Your Friends" portion of the set. 'You Know How I Do' was (of course) the first song played off the record, followed by 'Bike Scene'. 'Cute Without the E (Cut From The Team)' stole the show, with Adam Lazzara holding the mic up to the crowd to sing the famous line “why can’t I feel anything from anyone other than you?” Halfway through the set Lazzara greeted fans on the Electric Factory balcony, singing a few songs and making his rounds before making his way back to the stage. Although they had finished playing the record, the set ended with 'The Ballad of Sal Villanueva' and 'Your Own Disaster'. The performance was so spot-on, it seemed as if the actual record itself was being played through the speakers (although it obviously was not). After ten years, Adam Lazzara, Shaun Cooper, John Nolan, Eddie Reyes, and Mark O’Connell still have it.